"Nothing can compare to or compete with the love of God. As born-again believers, His love is shed abroad in our hearts by the Holy Ghost. His love is perfect and perfect love casts out all fear. God loves you! His love never fails and is without measure. God shows and clearly proves His love for us by the fact that while we were still sinners, Christ died for us (Romans 5:8 Amplified). Perfect Love provided the Perfect Sacrifice. We must go and tell; go and tell all the world of this great love. As we proclaim the Gospel of Christ, many will have an encounter with God's love, goodness, and power. Many on their way to a lost eternity, the flames of hell, will come to the saving knowledge of Jesus Christ and enter into the narrow gate which leads to life for all of ETERNITY. A Great Way to Start the Day Olivia W. from Brunswick, Georgia reported: I had breakfast at a sandwich shop. Carly was the only employee all morning, and I was the only customer. As I was leaving, I shared the Gospel script with her. Although she knew that God loved her, she was not sure, at all, if or why she would go to Heaven. Carly invited Jesus Christ to be her Lord and Savior. The Gospel is the power of God. Sharing the Love of God in the Nursing Homes Shannon C. from Longwood, Florida reported: I spent the day visiting people in a nursing home, sharing cookies, chocolates, and the love of Jesus. I was telling them the true meaning of Christmas � the Gospel of Jesus Christ. There were so many tears of joy on people's faces when they discovered that they were loved and not forgotten. Eighteen people received Jesus Christ as their Lord and Savior. One man, who had a stroke and was paralyzed on his left side in the bed, was healed in his arm and able to move it freely after laying hands on him and praying. Thank You Jesus! Sharing Christ Is a Way of Life Stephanie B. from Lafayette, Louisiana reported: After a man accepted Jesus at the store, he kept saying over and over, "You made my day; you made my day!� Share Christ wherever you are. Make it a lifestyle. The harvest is ripe! By R H Brown"
"I do seek his face continually. This is where I get my strength in faith." "My strength comes from the Lord! Amen! 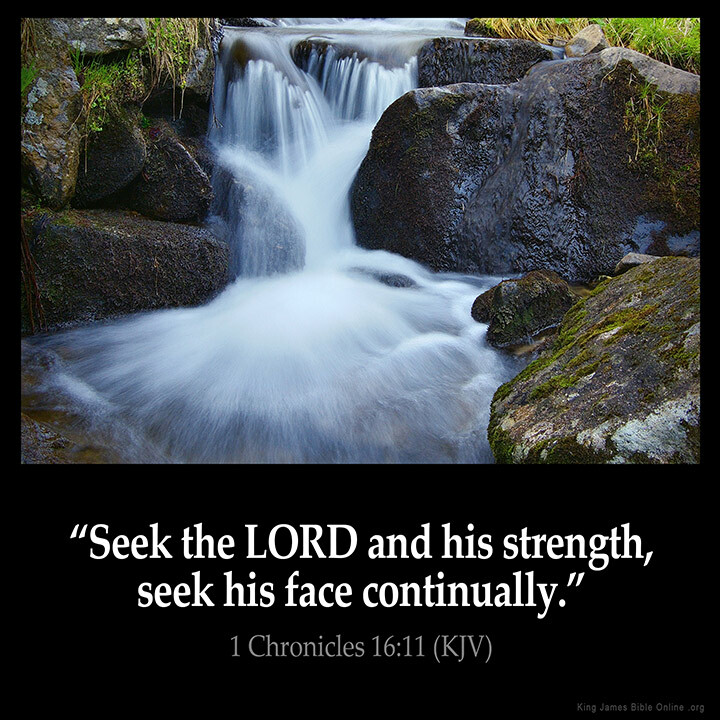 I will seek the Lord my God and Christ Jesus in all things!" "God said... "If you love me.. keep my Commandments." (y) 143"
"Amen Julie ,our time to serve Jesus will soon be past & the saying " only what's done for GOD will last .Lord Jesus how we need you ,we need YOU to make us bold to talk to the lost .give us wisdom & strength Lord Jesus only your Holy Spirit can speak to the hearts of the lost,OH GOD,do it now,amen"
"Happy New Years to you and your family god bless"
"Thanks for all the inspirational quotes i need them"
"When we seek Jesus he is found by us. O praise God in the highest"
What Do You Think of 1 Chronicles 16?